SAY WHAT YOU SEE®: We have moved! 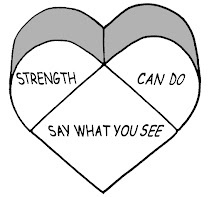 SAY WHAT YOU SEE helps you make sense of children's words, meanings and patterns in a way that deepens connection and makes life easier and more fun for everyone. Questions or comments? Jump right in and join us, or take a peek at our website and the SAY WHAT YOU SEE handbook posted in full there! To apply SAY WHAT YOU SEE to yourself for personal growth, visit my other blog. I am a parenting expert and everyday guru. In exploring the innate greatness of children, I have come upon my own. I love helping others do the same. Logic is my greatest transformational tool. I help people make sense of their lives and their children's behaviors. One other thing you should know about me: I can find greatness in pretty much anyone. Check out my website and other blog. What you write will be public. That's good and bad. Your posts will reach people all over the world, but so will the names you use for yourself, your children, and others in your comments. Please protect your identity as you see fit.